Venezuela's self-declared interim leader has set up a confrontation over US aid by calling for Venezuelans to cross borders and bring it into the country next week. 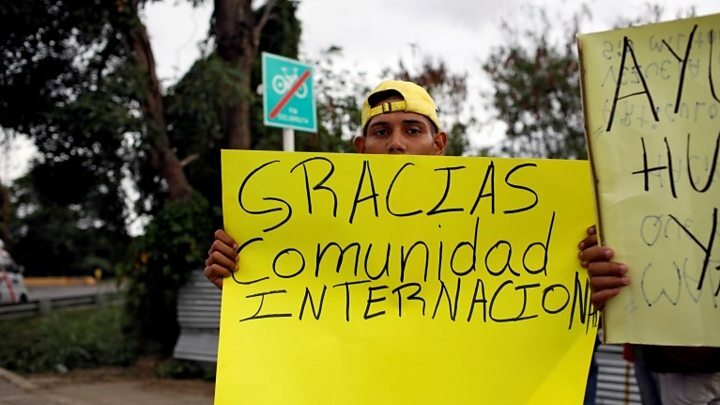 Juan Guaidó wants a "humanitarian avalanche" and "caravans" to go to the borders to get the aid next Saturday. President Nicolás Maduro says the aid is part of a US plot to disguise an invasion into Venezuela. The US says Mr Guaidó requested aid because the country was in crisis. USAID administrator Mark Green said children were going hungry, that nearly every hospital in Venezuela was experiencing medicine shortages and that three million people had left the country. US military planes have already delivered aid to the Colombian border town of Cucuta. Mr Guaidó said more aid distribution centres would be opened in the Brazilian border town of Roraima and in the Caribbean. 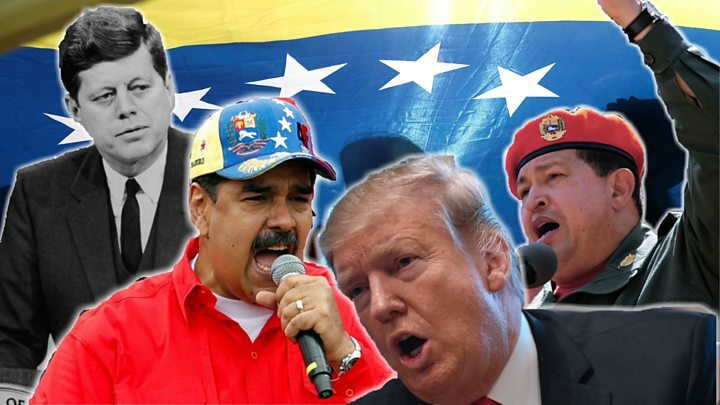 Outlining his plans for 23 February, Mr Guaidó, who is leader of the opposition-controlled National Assembly, urged Venezuelans to mobilise en masse in all of the country's states. He said aid would enter Venezuela by land and sea and also urged Venezuelans living abroad to demonstrate and for those in Colombia and Brazil to accompany the aid into Venezuela. In an earlier tweet he said 600,000 people had signed up as volunteers to help bring in the aid and appealed to the military - which has so far remained loyal to Mr Maduro - to "put itself on the side of the people" and let the aid in. Mr Guaidó has also said that more aid will be flown to the Dutch territory of Curaçao early next week. The opposition says that if it gets in Venezuela it will be first distributed to infants and pregnant mothers living in extreme poverty. He has denied there is any crisis in Venezuela and has called the operation a US-orchestrated show. On Friday he ordered the military to remain on high alert against what he described as US "war plans". His Vice-President Delcy Rodriguez meanwhile alleged that the US aid was contaminated with carcinogens "to poison our population" and described it as a "biological weapon", Spanish newspaper El Mundo reported. 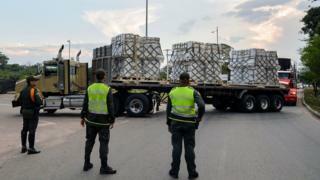 One road bridge between Venezuela and Colombia remains blocked on the Venezuelan side by shipping containers. Mr Maduro, who has been in power since 2013, was re-elected to a second term last year. But the elections were controversial, with many opposition candidates barred from running or jailed. There were also allegations of vote-rigging. The head of the opposition-controlled National Assembly, Mr Guaidó declared himself president on 23 January. He said the constitution allowed him to assume power temporarily when the president was deemed illegitimate. The US, some Latin American countries and some European countries, including the UK, support his claim. Russia, China, Mexico, Turkey and others say Mr Maduro is the legitimate president.